Manuscript from the collection of Henry VII 15 century France. There is no direct attribution for the artist. The Consolation of Philosophy, was written in 523 as a conversation between Boethius and philosophy personified Lady Philosophy who consoles him in prison. She discusses the transitory nature of fame and wealth ("no man can ever truly be secure until he has been forsaken by Fortune"), and the ultimate superiority of things of the mind, which she calls the "one true good". She contends that happiness comes from within, and that virtue is all that one truly has, because it is not imperiled by the vicissitudes of fortune. 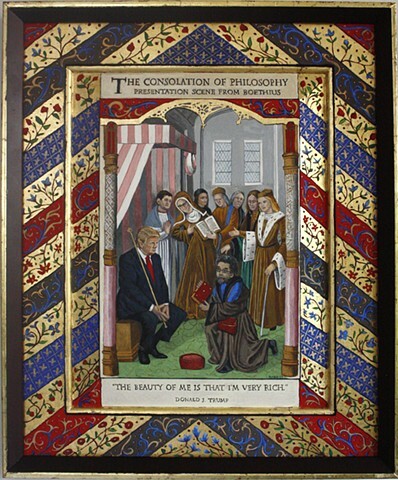 Surrounding Trump, clockwise, in this room are: Paul Ryan, Betsy DeVos, Jared Kushner, VP Pence, McConnell, Vladimer Putin, Ivanka and proffering the treatise on philosophy is Cornell West. 19 3/4" x 16 1/4"